“It’s not for pleasure we are in the sea. This nuclear plant is a curse and nobody is going to benefit out of it. Only a disaster can convince our politicians and the government. Then we won’t be alive to tell that story.” — 15-year-old Rishika Raj. During the past one year, the villagers living in areas surrounding the Koodankulam atomic power plant launched hunger strikes, tonsured their heads, went to jail, met the Prime Minister, the Chief Minister, and filed cases in various courts with a simple demand — to save their lives, their soil and their water from the killer nuke plant. Kudankulam Nuclear Power Plant (KNPP), and the government has scheduled dates for commissioning the plant. Taking a cue from the recent ‘jal satyagraha‘ (protesting while standing in water) launched by the farmers in various regions of Madhya Pradesh, the villagers at Idinthakarai decided to launch their own ‘standing waist–deep in the sea’ protest against the impending loading enriched uranium fuel at the atomic power plant. On Thursday, September 13, at 11 a.m., braving the scorching sun, hundreds of men, women and children from Idinthakarai and the neighbouring villages, assembled outside the church of “Our Lady of Lourdes” in Idinthakarai. 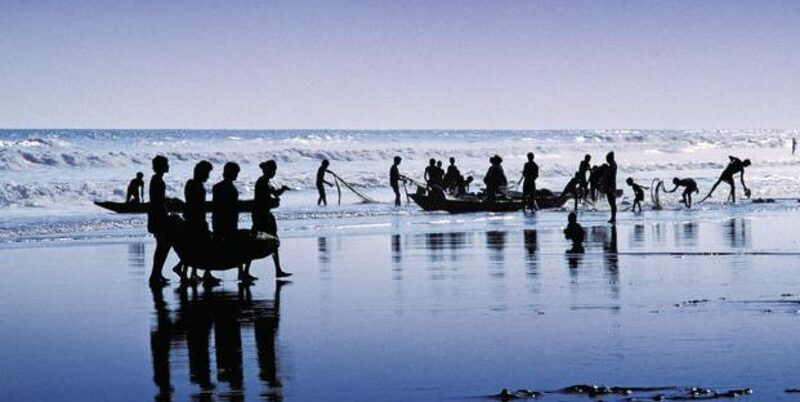 Led by Reverend Father M. Jesuraj, they walked down to the coast. They raised slogans against police brutality, the Central government and the Tamilndu State government. They waded into the sea about a kilometer away from the nuclear plant. 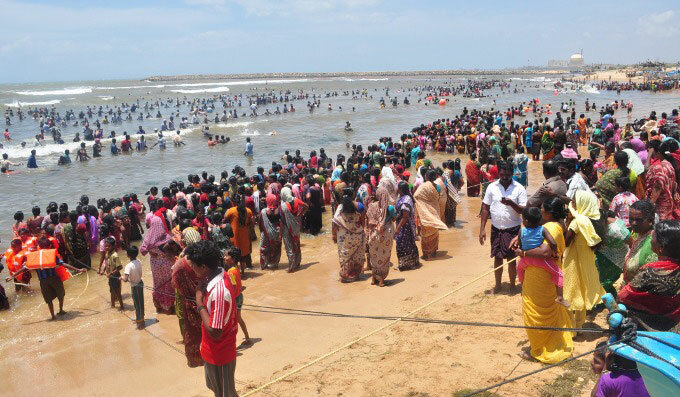 Hundreds of women and children waded into the sea along with the men. They remained there the whole day. Coast guards deployed Dornier aircraft for aerial surveillance while the protesters continued their agitation in the sea. They continued their protest till 4 p.m.
On Thursday, the Supreme Court refused to enforce stay on loading fuel at the Kudankulam plant. However, the judges agreed to examine the risk associated to the project and added that the safety of the people living in its vicinity concerned them. Now, more than 4,000 police personnel reinforced by Rapid Action Force, continue to maintain strict vigil after having sealed the entire Kudankulam area. Under Japanese regulations, the default period between inspections at reactors is 13 months, but changes made in 2009 allow operators to apply to increase this to 18 months. Subject to approval, a five-year introductory period would follow, after which the limit could be raised to 24 months between inspections – more in line with international practices.The median capacity factor for Japanese nuclear plants is about 70% – compared with over 90% for the best performers worldwide – with the country’s inspection requirements a contributing factor to this difference. Most other countries conduct regulatory checks so that utilities can operate their power plants almost all of the time that refuelling or major maintenance is not taking place.In mid May 2011, only 17 out of Japan’s 50 remaining nuclear power reactors (apart from Monju and written-off Fukushima Daiichi 1-4) were in operation. This represented 15,493 MWe, or 35%, of the total remaining nuclear generating capacity of 44,396 MWe. Twenty units, with a combined capacity of 17,705 MWe (40% of total nuclear capacity) were not operating as they had been shut for periodic inspections, while another two units (1700 MWe) had been shut for unplanned inspections or equipment replacement. Since then the number of operational reactors steadily dwindled to zero.Units 4 and 5 at Chubu Electric’s Hamaoka plant have been shut down at the government’s request to increase their resistance to tsunamis. Chubu is spending some JPY 140 billion ($1.7 billion) on seawall defences, which are expected to be complete by the end of 2013. During the shutdown process for the unit 5 ABWR, a burst pipe in the condenser allowed seawater to enter the main cooling circuit and some 5000 litres reached the reactor itself, evidently causing corrosion.